On June 4, U.S. Senator Jeff Flake (Rep., AZ) and Eric Schmidt, former Google Chief Executive and now a member of the board of directors of its parent company, Alphabet Inc., met in Havana with Cuba’s President, Miguel Diaz-Canel. Others in attendance were Cuba Foreign Minister, Bruno Rodriguez; the Foreign Ministry’s Director General of the United States, Carlos Fernández de Cossío Domínguez; Philip Goldberg, U.S. Charge d’Affaires in Cuba; and Cuba Communications Ministry officials. Below is a photograph of Flake and Diaz-Canel. Google and Cuba have been discussing how the company can help connect Cuba to undersea fiber-optic cables that run relatively near to the island, which would allow Cubans faster access to data stored around the world. Reuters, U.S. Senator Jeff Flake, Former Google CEO Meet With New Cuban President, N.Y. Times (June 4, 2018); Assoc. 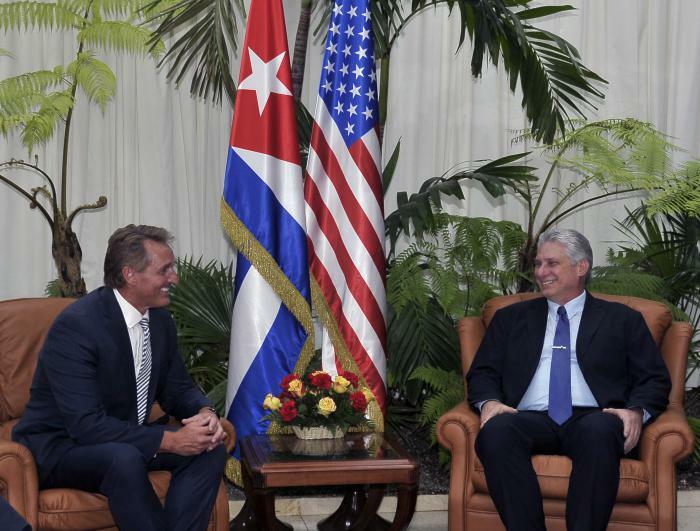 Press, Cuba’s new president meets with US senator, Google exec, Wash Post (June 4, 2018); Diaz-Canel received US Senator Jeff Flake and President of Google, Granma (June 4, 2008); Cuban President held a meeting with personalities from the United States, Cubadebate (June 4, 2018). See State Department Creates Cuba Internet Task force and Suspends Enforcement of Statutory Liability for Trafficking in Certain Cuban Expropriated Property, dwkcommentaries.com (Jan. 25, 2018); Cuba Protests U.S.’ Cuba Internet Task Force, dwkcommentaries.com (Feb. 1, 2018); Objections to the U.S.’ Cuba Internet Task Force, dwkcommentaries.com (Feb. 9, 2018). Now we examine the CITF’s membership, inaugural meeting, Charter and website. The CITF is chaired by Deputy Assistant Secretary for Western Hemisphere Affairs John S. Creamer, a foreign service officer with a distinguished career of service in Latin America. Other members are officials of the Office of Cuba Broadcasting, which operates TV and Radio Marti; the Federal Communications Commission; the Department of Commerce’s National Telecommunications and Information Administration; the U.S. Agency for International Development; Freedom House; and the Information Technology Industry Council. Tom Sullivan, chief of the FCC’s International Bureau, said there are no direct, undersea cables between the U.S. and Cuba, though he said there appear to be some U.S. satellites providing service in the island. The CITF decided to form two subcommittees: one to explore the role of media and freedom of information in Cuba, and the other to explore Internet access in Cuba. The subcommittees will provide the task force a preliminary report of recommendations within six months (by the end of August) based on input from relevant experts and stakeholders. The task force agreed to reconvene in October to review the preliminary reports, after which it will prepare a final report with recommendations for the Secretary of State and the President. At the end of the meeting, the public was invited to make comments. Several Cuban dissidents lambasted Cuba’s government, drawing comparisons to World War II and to the governments of Syria and Iran. Others centered on a critique of the decades-old U.S. economic embargo and Trump’s policy toward Cuba. Some argued that any U.S. efforts would backfire, by undermining the perceived independence and credibility of burgeoning independent media in Cuba. In addition to repeating the information about the CITF’s inaugural meeting and membership, the website has links to its Charter and Membership Balance Plan. More importantly, it provides a form for submission of public comments. According to the Membership Balance Plan, the CITF shall have no more than 12 members, of whom 10 shall be from relevant U.S. federal government departments and agencies. The other two shall be (a) a representative from an internet-related non-governmental organization and (b) a representative from an internet-related private-sector entity. A subsequent post will examine reactions to the CITF and its inaugural meeting. U.S. State Dep’t, Inaugural Meeting of the Cuba Internet Task Force (Feb. 7, 2018). Assoc. Press, ‘Tear Down This Firewall’—US Looks to Expand Cuba Internet, N.Y. Times (Feb. 7, 2018). U.S. State Dep’t, Website: Cuba Internet Task Force. U.S. State Dep’t, Charter of the Cuba Internet Task Force (Dec. 4, 2017); U.S. State Dep’t, Membership Balance Plan, Cuba Internet Task Force (Nov. 1, 2017).